Fabric dye is used on fabric or clothing to dye it a different solid color, or you can use techniques to create unique patterns. Rit Dye and Dylon Permanent Fabric Dye work in different ways and each have their own strengths. With Rit DyeMore Synthetic Fiber Dye you can now dye polyester, nylon, acrylic, rayon, and poly/cotton blends. You can find it with our other Rit liquid dyes. Rit dye, which is a multi-purpose union dye, is versatile, easy to use and nontoxic. You can dye natural fibers like cotton, linen, wool, silk and also rayon and nylon fabric. Cotton blends with polyester or spandex will dye lighter and less intense. There are many colors and you can easily mix them to get custom colors. The downside with Rit compared to fiber reactive dyes is the colors are less intense and not as colorfast. It is important to use hot water to activate Rit dye and get the most vibrancy. Adding salt or vinegar depending on the type of fabric will help the fabric absorb the dye. 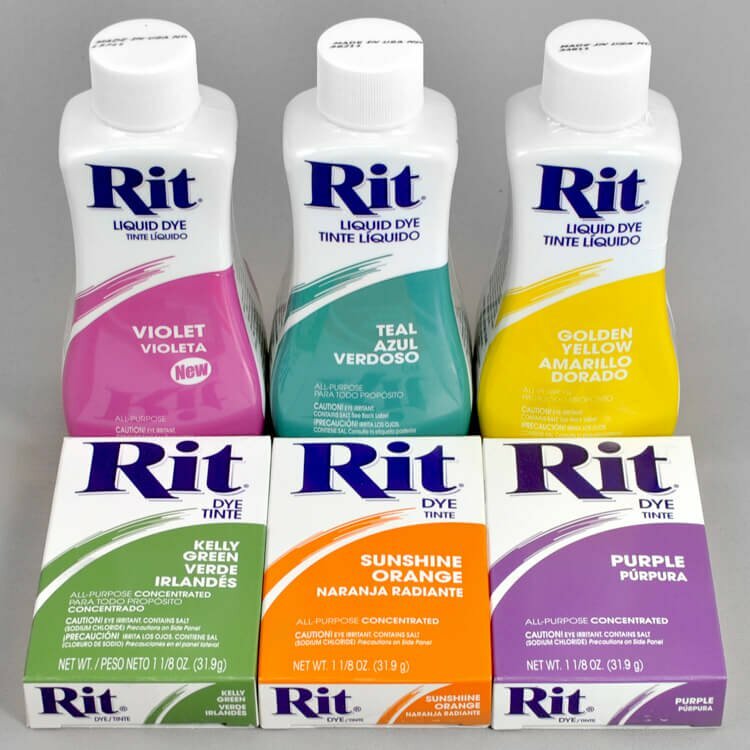 Use Rit Fixative before rinsing to reduce color bleeding and fading. For instructions, see How To Dye Fabric: Immersion Dye Technique. Rit comes in both liquid and powder forms. Liquid dye is more concentrated than the powder, so you need half as much liquid. Another option is Rit Color Perfect Liquid Dye Kit, which comes with pre-mixed, ready to use dye and 3 different applicators. You can find it with our other Rit liquid dyes. If you want to dye polyester, acrylic, and other synthetic fibers, Rit Dye now has a dye for that too. To find out how to use it and see how it works on different types of fabric, take a look at How to Use Rit DyeMore Synthetic Fiber Dye. Dylon permanent dye is a fiber reactive dye, meaning it reacts chemically with cellulose found in cotton, rayon and silk to create a permanent bond. It won’t fade and the colors will be more intense than rit dye. It doesn’t need heat to activate. Fiber reactive dyes use soda ash as a fixative. Dylon Permanent Dye has the soda ash already added, so you don’t need to purchase it separately. Rit dye is a good multi-purpose dye for a wider variety of fabrics, while fiber reactive dyes provide the best intensity and permanence. Click here to see our fabric dye selection. Can you use the ritual polyester dye on cotton linen blend? BEST ANSWER: Yes, DyeMore will work on cotton and linen, but we'd suggest using the all-purpose Rit dye if it's not attached to another fabric that needs to be dyed with DyeMore. Keep in mind, different types of fabric will often dye to different darknesses. Cotton/linen absorbs the dye better so they will be a darker shade than polyester. where can we buy in macau? BEST ANSWER: To view pricing in your preferred currency, please visit our "Shop Internationally" page and choose the appropriate country and currency. You will then be able to view the pricing in that currency on the product pages. We ship all over the world. To view international shipping rates, add the desired items to your cart and proceed to the checkout process. In the Shipping Information section, check the box that says "International Order?". This will calculate shipping rates for you once the shipping address is entered in the form.